[UPGRADE] Searik motion sensor lights with sophisticated look, which is battery powered and can turn on automatically it's in dark when motion detected. The led night lights with hook can hang on anywhere, sent with 3M adhesive pads can be stick anywhere, and also built-in magnet can stick at any metal surface. Bright Enough and easy to install, keep you and your family never stumble at dark. >> Perfect for home, kitchen, stairs, cabinet, closet, bedroom, bathroom, hallway or the entryway to your home where the light switch is a little far away from the door. >> Auto-on within 10 feet when motions detected and off after 15-30 seconds when no activities detected. >> Easy to replace the overhead ceiling lights, which is too bright in the dark, avoid to wake up the sleepers. >> The sleak and stylish design little lights will look great at anywhere in your home and easy to install within several seconds, no tools or hammers needed. >> Simply use the super-strong 3M adhesive double-side tape, just peel and stick on any surface, or slap on any metal surface with the built-in magnet. 4 WAYS TO USE MOTION SENSOR LIGHTS - 4 Ways to easily install the battery lights, no tools and screws required. 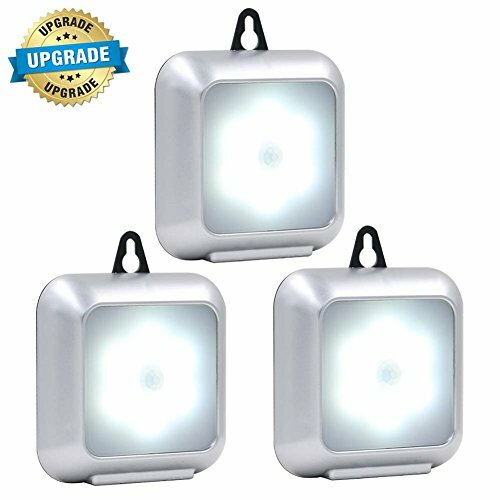 (1) Stand portable lights on table or flat surface directly; (2) Hang stair lights on a hook in kitchen, bathroom, laundry room and etc; (3) Hallway lights are sent with 3PCS adhesive pads, easy to peel and stick on anywhere; (4) Built-in magnet, easy to stick on any metal surface.